What was your inspiration for writing LIES I TOLD? It started with an 80s movie called GRIFTERS and evolved from there. How long did you work on LIES I TOLD? The whole process took about nine months, in part because it was originally written in the third person. It was actually my editor's call to try writing it in the first. It has since been praised for the first-person narrative (one article called it "searingly honest"), which I take as proof that having an amazing editor is everything. I love writing so much that I enjoy writing ANY kind of story. So far I've written Gothic fantasy, paranormal, thrillers, contemporary, and romance. And I loved every one of them and have learned equally from them. It's really incredible to realize that the craft of storytelling transcends genre, and that my voice as a writer is still there regardless of which genre I'm writing. What do you hope readers will take away from LIES I TOLD? I hope readers will see how profoundly we're impacted by the story others tell us about ourselves. When important people in our lives tell us bad things, we often carry that forward and it can have a lasting effect on how we view ourselves and what we believe we deserve. Of course, the same is true of the good things, and I hope readers will begin to question the stories they've been told -- and the ones they tell themselves -- when they aren't aligned with the belief that we all deserve to love and be loved. And the good news is, we can change the story we tell ourselves, and we can choose to surround ourselves with people who tell us the best possible story. I was pretty determined to get published, so I wrote five books in two-and-a-half years. For me it was never a question of if I'd be published -- just when. I figured I'd write as many books as it took. My second book almost sold, and while it was on submission I wrote three more books, the last of which was the book that became Prophecy of the Sisters. When my second book didn't sell, I switched agents and revised Prophecy for ten months with my new agent before it sold in a three day pre-empt to Little Brown. My "AHA!" moment was the minute I finished my first book. I'd always been a writer, but I was prone to quit things halfway through and start something else. Finishing my book gave me the confidence to know I could do it, and it also allowed me to see the process at a high level. Everything I'd read and learned about craft up until that point clicked when I finished that first book, which is why my first advice to writers (beyond the classic advice of reading and writing a lot) is to finish something. Even if it's terrible, you'll learn more from the process than from anything else you can do, even if it doesn't sell. I work in my home office, which overlooks a big field on our property. There's a giant tree outside my window, and I often see squirrels scurrying up and down the branches and see birds coming and going. I only work there, and my brain sort of switches to writing mode as soon as I sit at my desk, light my candles, and put on my headphones. I always create an instrumental playlist for my books so the lyrics don't interfere with my own words. I just finished a classic Nicholas Sparks-type romance for YA. It's kind of a YA Bridges of Madison County meets The Longest Ride. Now I'm working on two new projects; one about two sisters weathering in very different ways their parents divorce and their father's subsequent abandonment, and the other about three young people who begin to question their friendship when a local controversy about the discrimination of Arab-Americans erupts in their small town. The second project is based on our experiences recently with a controversy at my son's school when the Pledge of Allegiance was read aloud in Arabic as part of National Foreign Language Week. 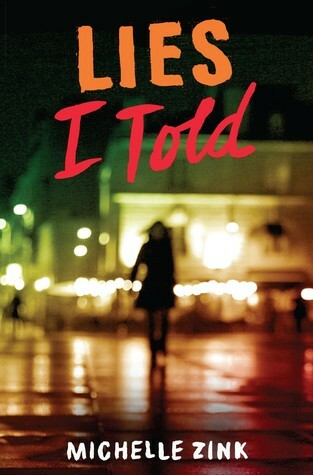 What did you think of our interview with Michelle Zink, author of LIES I TOLD? Let us know in the comments! Terrific interview. I absolutely LOVED Lies I Told. I did think a lot about The Grifters when I started reading it, but soon just got lost in the story. Wonderful book. Thanks for this interview.